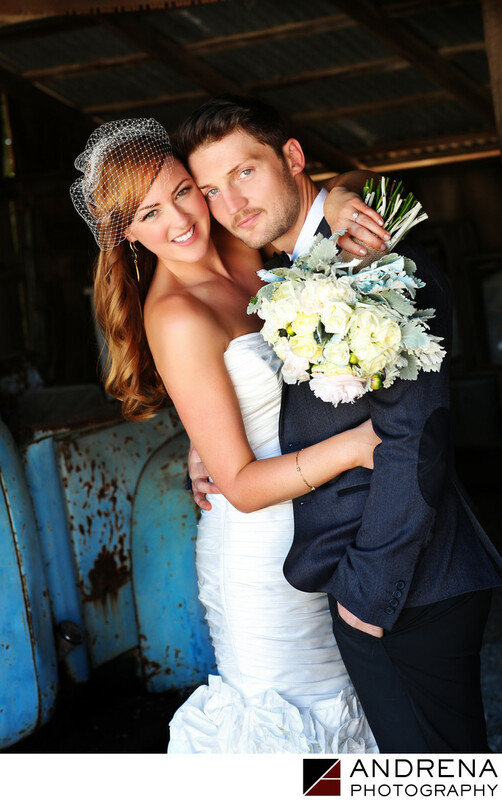 Musician Kevin Earnest and his bride Katie chose the Dana Powers House and Enchanted Barn in Nipomo, California, for their vintage wedding. This site is just gorgeous, with lush gardens, and tons of vintage details everywhere. I cannot say enough wonderful things about this property. Near the barn, there's an old blue truck that provided a fun backdrop for portraits. Thee barn itself is full of vintage luggage, chalkboard signs, mason jars, old books and so many other beautiful details. The house and barn are also right next to an orange grove full of trees filled with fruit. And as if that wasn't enough, the barn is nestled up against a gorgeous field, which is perfect for sunset portraits. Kevin wore a stylish, fitted suit, while Katie's birdcage veil added to the vintage feel of this wedding. I loved working with this couple, and I adored photographing their wedding at the Dana Powers House and Enchanted Barn in Nipomo.